Flat-cut Stainless Steel sign letters (most people simply ask for flat stainless steel letters) are produced by cutting your design (letter or logo) from a flat sheet of high quality stainless steel sign material using state-of-the-art waterjet cutting equipment. 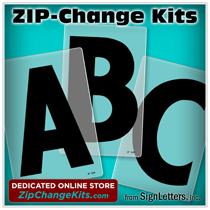 Because there are no molds or forms (which are required for cast metal letters or logos cast from aluminum) we can quickly reproduce your custom job needs at a reasonable cost. Stainless Steel will last for a lifetime, actually our sign letters from Gemini are guaranteed to do just that! The material thickness will determine the "depth" of the finished letter product and this choice will also control the price. We need to establish the depth of the metal material here because there are some options which change due to the letter thickness.